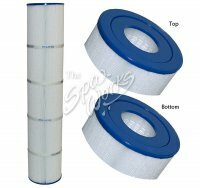 Hot Tub Filter 95 Square Foot Filter Replacement Cartridge. Used In The Following Spas: Cal Spas, Coast Spas (Canada), Infinity Spas, J.E.M. Spas, Lifestyles Spas (Canada), Maax Spas, Statewood Spas, QCA Spas, Savannah Spa, And WaterWay Topload In-Line Filters. Unicel C-4995, Pleatco PCAL100, Filbur FC-2940.